With Adthena Brand Protection you can catch all brand bidding and trademark infringements your brand is exposed to, and gain a better understanding of the impact competitive activity is having on your brand. Our Brand Market View provides an AI-learned perspective of an advertiser’s search landscape. It is the only competitive intelligence solution that monitors digital brand performance in its entirety, tracking all competitive movement and activity across protected brand terms, and not just across a small subset of search. 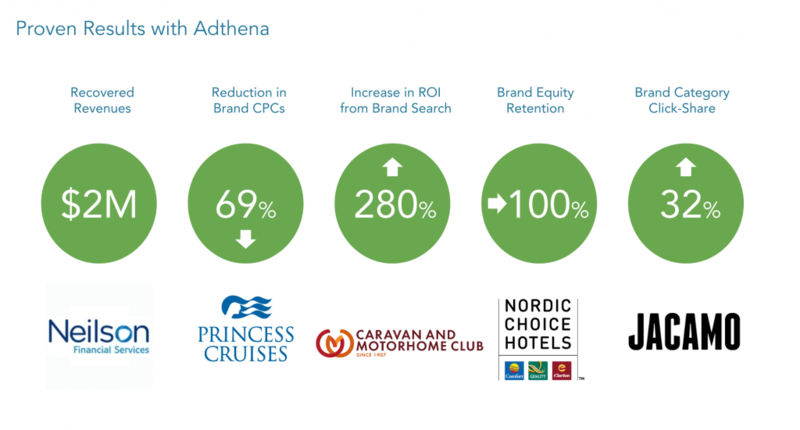 Adthena is the world’s most powerful brand protection solution for search. We provide enterprise level brand monitoring and AI-powered data analysis, with scale and sophistication unmatched in the industry. Brand Radar is a powerful dashboard that provides an instant overview of your most important brand protection metrics. Instantly gain an understanding of brand health, generate advanced data visualizations of competitor strategies, and drill down into competitive bidding activity with hour-by-hour granularity. Discover how Adthena enabled a 10x increase in ad infringement detection. Adthena Brand Protection gives you hour by hour data granularity. Instantly see clusters of increased competitive bidding, identify patterns and trends, and isolate competitor tactics before taking further action. “The solution is a slick end-to-end experience where we pull key brand information and relay it back to the C-Suite." Identify Brand Opportunities and initiate action, with an integrated, scalable Auto Takedown process for competitive infringements. Save time, resources, and handle infringements before they become a problem. Automatically monitor and detect every move your competition makes, so you can stay in control. Define custom rule sets and triggers so you are alerted when competitive activity reaches boiling point. "The Adthena Brand Protection solution solves a big brand challenge for us. At Insure and Go, we have a unique brand term, but it is also quite generic in terms of where we are in the market. Adthena makes it much easier to spot trends, so we can understand our competitors and whether they are deliberately targeting our brand, or just not being precise with their generic activity." Adthena guarantees results in search. Or you can have your money back.